Your Home SOLD at a Price Acceptable to You, GUARANTEED or We Will Buy it! 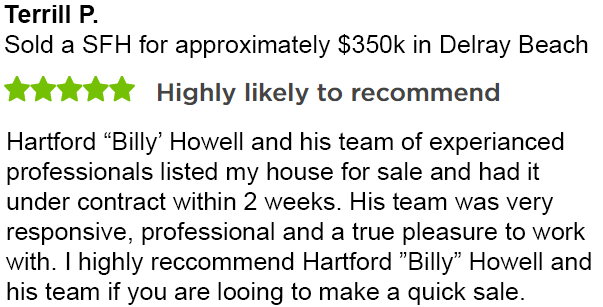 The Howell Realty Group GUARANTEE's in writing, that your home will sell at a price acceptable to you or we will buy it! * No Gimmicks. Your Home WILL Sell THREE TIMES Faster! Homes sold with the Howell Realty Group averaged only 46 Days on the market in 2016 while the national average is 110 days! We have over 4,000 Buyers in our database meaning we may have a Buyer for your home right now! Your Home is More Likely to Sell! The Howell Realty Group has successfully brought together over a thousands buyers and sellers together in Palm Beach County, yours can be next! 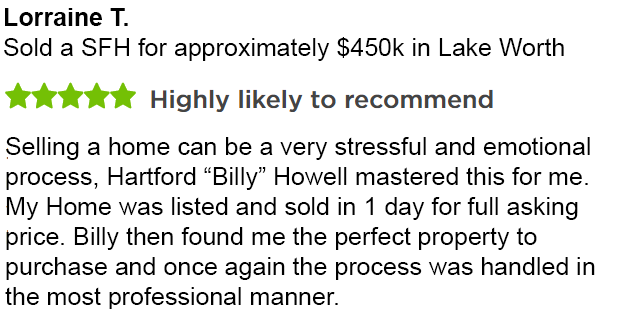 Reviews from Past Clients, Click to Read More.